Discussion in 'vBench (Works in Progress)' started by MarquisMini, May 31, 2008. I have been enjoying this forum, but this is the first figure I have posted here at PlanetFigure. I have been working on a large diorama of Yorktown preparations focussing on the French Regiments that participated. To date I have completed approximately 15 of the 45 anticipated figures (60mm). Total size is expected to be 24" x 24" on four separate 1 foot square panels. 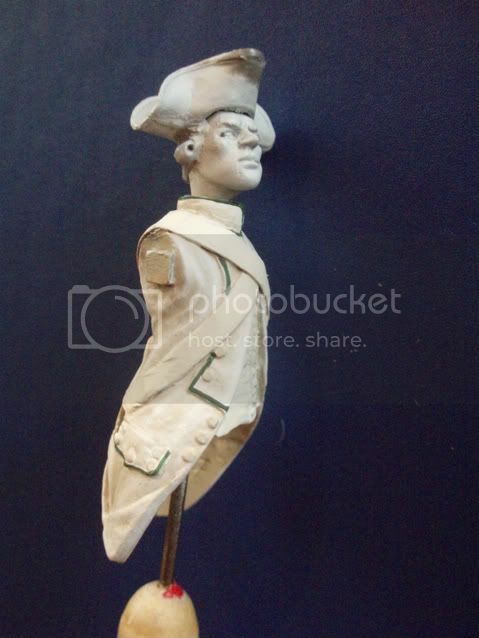 The body here is produced by Modeles et Allures and was originally the 1767 uniform which I converted using Procreate to the 1779 regulation. Credit goes to Adrian Hopwood (Basement Forum) for his advice on creating the proper effects in white and I have leared a great deal from Hardy Tempest and others here. I will continue to post photos as this figure progresses and would appreciate any comments, thoughts, or feedback that you believe might improve the outcome. Aplogies in advance, I have not yet mastered the skill of miniature photography which seems to have made this figure appear lighter than it does to the naked eye. I'd like to therest of the figures. So far, this one looks pretty good. a 45 figures diorrama! wow this will be a big one! 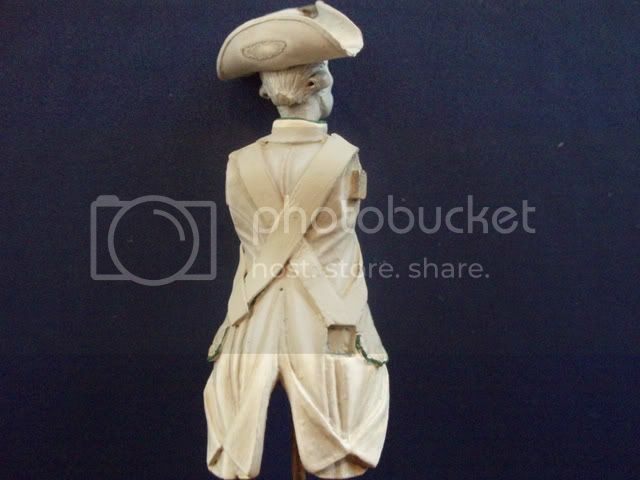 and if all figures are sculpted so good as this one it will be a very nice one, too! Excellent work Daniel. I look forward to seeing your next step. Thank you all for the kind words.Painting so many figures for a diorama is not an easy task.When i started a year ago,i tought that painting a figure was,for the "whites",just paint basecoat white ,then add shadows and highlights,certainly i am learning every day,thanks again for your support and i will keep posting progress pics this coming week. Daniel,Very nice looking piece.45 together will just be fantastic. Good luck with it and I hope you share some pics when you're finished. P.S.That must really hurt when you pin the figure into the top of your finger! Very good start on such a huge project, looking forward to seeing more. Daniel, you're doing a great job. Apologies for not being in touch regarding the white mixes. Will do so in the near future. Stephen,actually i try the mix that you used on the tutorial(El Greco),maybe not exactly the base color but very close.Thanks for all your help and looking forward to show you and all of the members mi finished figure. I looking forward to the finish off this large projekt. Wow! That's some dio you're planning. I really admire modellers who think big. 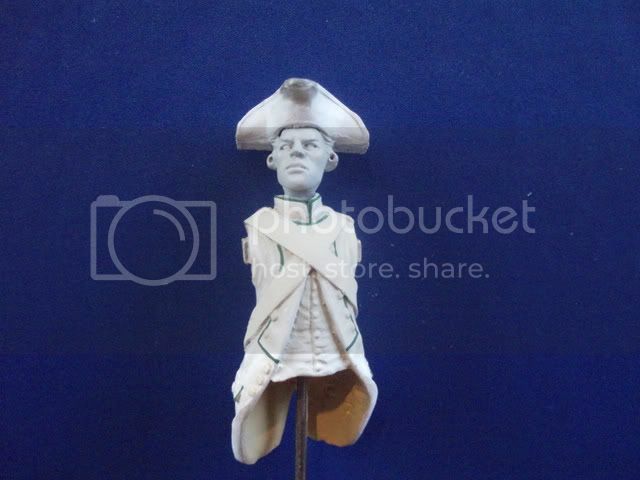 I had a look at the website for Modeles et Alleurs, is 20 euros the price of a single painted or an unpainted figure? So 45 figures would be 900 euros? Ouch! I'd never get that one past my wife! I'm really looking forward to how this one develops. So 45 figures would be 900 euros? Ouch! I'd never get that one past my wife! progress photos can be found below. Added adittional highlights to several areas of the coat,especially to the lapels. Also added a fine dark line to increase the depth of the dark green trim facing color.